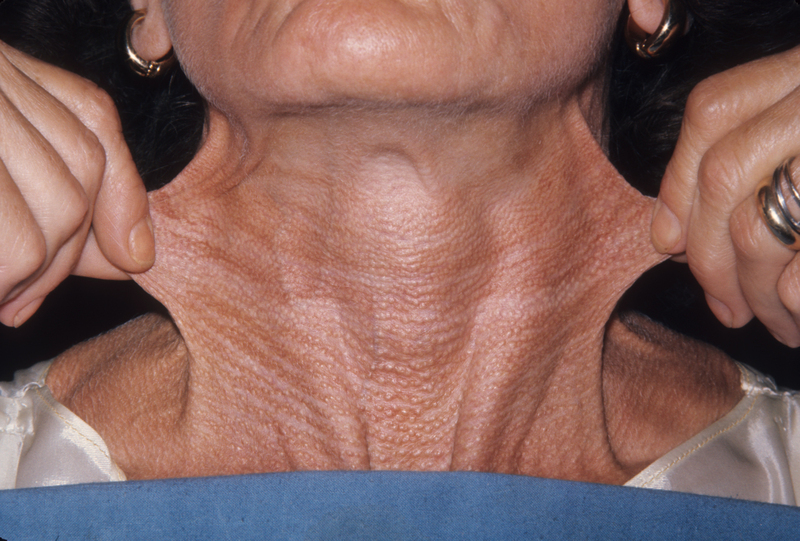 Pseudoxanthoma elasticum is a rare inherited disorder of connective tissue that is characterized by an unbalanced elastic fiber metabolism and synthesis, resulting in fragmentation and calcification of the fibers. The alterations in the ABCC6 gene responsible for Pseudoxanthoma elasticum. Clinical manifestations occur in the skin, ocular, gastrointestinal, and cardiovascular systems. Characteristic skin lesions are seen in the axilla, antecubital and popliteal fossae, and groin. The yellow, xanthoma-like papules occur in redundant folds of skin and are said to resemble plucked chicken skin. Surgical management involves standard vascular techniques, with the exception that arterial conduits should not be employed in cardiac bypass.